Tuesday, June 2, 2015 | 6–9:30 p.m.
BBG’s Spring Gala is sold out! To be added to the BBG Spring Gala waitlist, please call Tracey Doolin at Inez Weinstein Special Events: 212-254-6677, ext. 302. Tickets range from $500; tables for ten start at $7,500. After Party tickets are still available! Complimentary valet parking provided for cocktails and dinner guests. From May 28 through June 16, help the Garden raise funds by bidding on unique items and experiences at the Spring Gala online auction. Visit Charity Buzz to make your bids today! Please join us at the Spring Gala and be among the first to experience this extraordinary new garden! 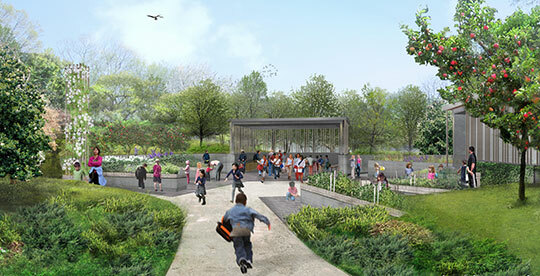 Designed by renowned landscape architects Michael Van Valkenburgh Associates, the Discovery Garden will offer thousands of children throughout New York City an amazing outdoor classroom where they can explore nature as junior scientists and young discoverers. Building on BBG’s long history as an internationally recognized leader in environmental education, this one-acre garden features distinct habitats—marsh, meadow, and woodland, along with a hands-on learning courtyard—that will help kids connect with the world of plants, cycles of nature, wildlife, and ecology. Brooklyn Botanic Garden welcomes more than 800,000 visitors a year to enjoy its remarkable collection of over 12,000 different kinds of plants, including many rare and endangered species. BBG also maintains a strong commitment to its founding vision of environmental education, conservation, and community engagement. Each year, the Garden reaches 150,000 children, teachers, and families through environmental education programs, offered free or at minimal cost, and engages 50,000 Brooklyn residents in urban greening programs that bring neighbors together to strengthen communities on a grassroots level. Fostering the next generation of environmental stewards is at the heart of all that the Garden does, beginning with instilling a sense of delight, curiosity, and respect for the natural world—and the Discovery Garden is a springboard to these experiences. The Spring Gala celebrates this spirit of unfolding discovery and provides essential support for the Garden’s world-class programs and collections. Learn more about the new Discovery Garden.